This enormous collection of more than 40 songs highlights the biggest hits from the start of the new millennium. 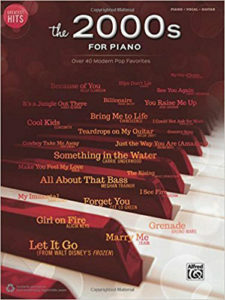 Piano accompaniment, vocal melodies, lyrics, and guitar chord diagrams are included. Titles include: “All About That Bass,” Meghan Trainor; “Billionaire,” Travie McCoy; “Cool Kids,” Echosmith; “Country Song,” Seether; “Forget You,” Cee Lo Green; “Grenade,” Bruno Mars; “I Still Can See Your Face,” Barbra Streisand and Andrea Bocelli; “Jesus, Take the Wheel,” Carrie Underwood; “Let It Go,” (from Frozen); “Make You Feel My Love,” Adele; “My City of Ruins,” Bruce Springsteen; “The Prayer,” Celine Dion and Andrea Bocelli; and “Teardrops on My Guitar,” Taylor Swift.